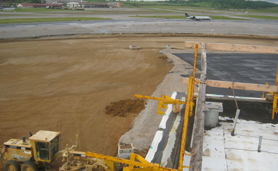 Dunn Construction is the Birmingham Airport Authority’s prime contractor in the rehabilitation project of Taxiway ‘A’—the Birmingham International Airport’s main taxiway. The project, valued at $5,100,000, involves pavement reconstruction and rehabilitation for a significant portion of the taxiway. The project, which will be complete in 2012, involves precise coordination between the Birmingham Airport Authority and our subcontractors in order to ensure timely completion of the various phases under the uniquely challenging conditions of an airport environment. To prevent any disruption of air traffic on the taxiway, a significant portion of the pavement rehabilitation work was performed at night.